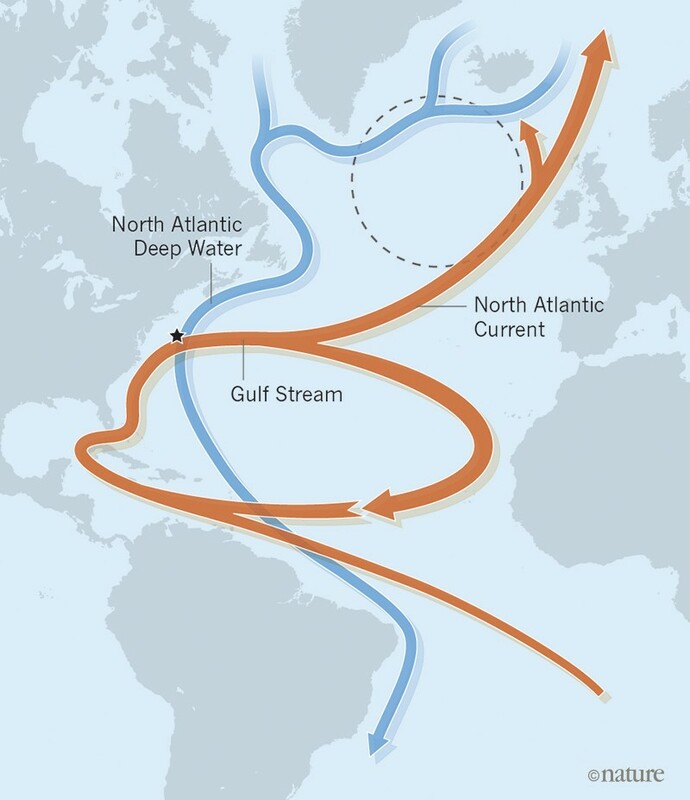 The warm, salty waters of the Gulf Stream make a northeasterly meander across the Atlantic Ocean, eventually forming the North Atlantic Current, which then funnels into the Nordic Seas. In the chill of winter, these waters cool and descend with the heavy load of their salinity. This deep convection is a key part of the Atlantic meridional overturning circulation (AMOC; Fig. 1), which can be thought of as an ocean conveyor belt that releases heat to the atmosphere above the North Atlantic Ocean before travelling through the abyssal ocean to resurface in other areas of the world1. Figure 1 | The Atlantic meridional overturning circulation (AMOC) and the subpolar gyre. The AMOC is an ocean circulation system that consists of warm surface currents (orange) and cold deep-water return flows (blue), as shown in this simplified representation. The surface currents include the Gulf Stream, which feeds a branch of the AMOC known as the North Atlantic Current. The deep-water return flows start from three branches that merge into the North Atlantic Deep Water. Thornalley et al.5 used measurements of silt in sediment cores to reconstruct the flow speed of the AMOC in the past 1,600 years; the black star indicates the approximate location at which the sediment cores were collected. Caesar et al.4 analysed temperature anomalies in the North Atlantic subpolar gyre (dashed line) to infer changes in AMOC flow in the past century. Both studies conclude that the AMOC has weakened by about 15% during the periods considered, but they differ on when the flow started to decline. Given the importance of the AMOC to heat exchange between the ocean and the atmosphere, the varying strength of this system is thought to have major impacts on the global climate, and has been implicated widely in some of the most remarkable and abrupt climate changes of the past2. Direct measurements of the modern AMOC flow rates show a decline in its strength in the past decade3. Reconstructions of the natural variability and long-term trends of the AMOC are needed, however, to put these recent changes in context. Two papers in Nature, by Caesar et al.4 and Thornalley et al.5, report on past AMOC variability using different approaches. Both conclude that the modern AMOC is in an unusually subdued state, but they diverge in the details of how and when the AMOC’s decline commenced. Caesar and colleagues inferred changes in the strength of the AMOC in the past century from patterns of anomalies in sea surface temperature (SST) that arise in the North Atlantic when the AMOC weakens. The weakening leads to a warming in the Gulf Stream and a cooling in the subpolar gyre — the cyclonic system of wind-driven ocean currents that lies to the south of Iceland (Fig. 1). Although the link between the relatively cool SSTs of the North Atlantic’s subpolar gyre and a slowdown of the AMOC have been studied previously6–8, the main advance of Caesar and colleagues’ work is their comprehensive comparison of global SST data sets with state-of-the-art, high-resolution climate models. The authors’ data analysis shows that this bipolar pattern of cooling and warming emerged in the mid-twentieth century. When they performed climate simulations under a 1% yearly increase in carbon dioxide, the model produced a pattern of SST anomalies in the North Atlantic similar to that seen in the observational data, and demonstrated that this pattern was associated with a decline in AMOC strength. The authors then calibrated the model’s results with their SST data to estimate that the AMOC has declined by about 15% in the past half-century. They infer that the slowdown in the AMOC was probably a response to warming caused by anthropogenic greenhouse-gas emissions. A possible mechanism could be enhanced melting of the Greenland Ice Sheet7, which adds fresh water to the surface ocean and reduces the density of the water that drives deep convection. Thornalley et al. provide a longer-term perspective on changes in AMOC strength during the past 1,600 years using a proxy measurement — the ‘sortable-silt’ grain size9 — of deep-sea sediment cores that reflects the speeds of the bottom waters that flow along the path of the North Atlantic Deep Water, the deep-water return flow of the AMOC (Fig. 1). They combined this approach with a method similar to that used by Caesar and colleagues: they used past, near-surface temperature anomalies recorded in the marine sediments to provide additional constraints on the AMOC. The researchers found that the strength of the AMOC was relatively stable from about ad 400 to 1850, but then weakened around the start of the industrial era. This transition coincides with the end of the Little Ice Age — a multicentennial cold spell that affected many regions of the globe10. Thornalley and colleagues infer that the weakening of the AMOC at that time was probably a result of the input of fresh water from the melting of Little Ice Age glaciers and sea ice. They estimate that the AMOC declined in strength by about 15% during the industrial era, relative to its flow in the preceding 1,500 years. This is remarkably similar to Caesar and co-workers’ estimate, despite the different time periods on which they base their estimates. However, the roughly 100-year difference in the proposed timing of the start of the AMOC decline in these two studies has big implications for the inferred trigger of the slowdown. Caesar et al. clearly put the onus on anthropogenic forcing, whereas Thornalley et al. suggest that an earlier decline in response to natural climate variability was perhaps sustained or enhanced through further ice melting associated with anthropogenic global warming. Nevertheless, the main culprit in both scenarios is surface-water freshening. The two studies are classic examples of ‘top-down’ and ‘bottom-up’ approaches, and so it is unsurprising that there is some misalignment between them. Caesar et al. take the top-down approach: their inferences of changes in the AMOC strength are made from reconstructions of regional and global SSTs that are derived from direct measurements of temperature. It is possible that regions other than the North Atlantic in which there has been decadal-scale variability in SSTs could influence the mean global SST from which the AMOC strength is calculated — although the authors do attempt to quell such doubts by showing that the subpolar-gyre SST anomaly is robust relative to the global mean SST for a subset of time periods (see Extended Data Fig. 2 in ref. 4). Thornalley and colleagues’ strategy is more of a bottom-up approach: they use a proxy for deep-water current strength to measure AMOC strength more directly than do Caesar and co-workers. The weaknesses of this approach are that it accounts for only the local bottom currents at the sites from which the cores are taken, which might not capture the entire AMOC system, and that it could be susceptible to local nonlinear effects such as abrupt shifts in the position of the current. However, Thornalley et al. show that there is a striking correlation between their grain-size proxy and the measured density of the Labrador Sea Water (a major component of the North Atlantic Deep Water), as well as with the heat content of the subpolar gyre; these correlations shore up the bridge that links their localized proxy measurements to broader-scale changes in the AMOC. For now, the timing of the AMOC decline remains a source of intrigue. Future studies that provide a more-detailed spatial network of multiple proxy reconstructions will help to clarify some of the remaining ambiguity about which elements of the AMOC were changing and when. It is — at least scientifically — reassuring to see that the present two studies converge on the conclusion that the modern AMOC is in a relatively weak state. However, in the context of future climate-change scenarios and a possible collapse in the AMOC11 in response to the continued melting of the Greenland Ice Sheet12, it is perhaps less reassuring, because a weakened AMOC might lead to considerable changes in climate and precipitation patterns throughout the Northern Hemisphere13. 1. Broecker, W. S. Oceanography 4, 79–89 (1991). 3. Srokosz, M. A. & Bryden, H. L. Science 348, 1255575 (2015). 4. Caesar, L., Rahmstorf, S., Robinson, A., Feulner, G. & Saba, V. Nature 556, 191–196 (2018). 5. Thornalley, D. J. R. et al. Nature 556, 227–230 (2018). 6. Drijfhout, S., van Oldenborgh, G. J. & Cimatoribus, A. J. Clim. 25, 8373–8379 (2012). 7. Rahmstorf, S. et al. Nature Clim. Change 5, 475–480 (2015). 8. Menary, M. B. & Wood, R. A. Clim. Dyn. 50, 3063–3080 (2017). 9. McCave, I. N., Manighetti, B. & Robinson, S. G. Paleoceanography 10, 593–610 (1995). 10. PAGES 2k Consortium. Nature Geosci. 6, 339–346 (2013). 11. Liu, W., Xie, S.-P., Liu, Z. & Zhu, J. Sci. Adv. 3, e1601666 (2017). 12. Bakker, P. et al. Geophys. Res. Lett. 43, 12252–12260 (2016). 13. Jackson, L. C. et al. Clim. Dyn. 45, 3299–3316 (2015).